We prefer to start rentals on weekends, but we have flexibility. Wolves, bear, moose and elk abound in our area of Yellowstone and the Beartooth Mountains. There are beautiful mountain views from the back deck, and front windows. Some of the best wild trout fishing in the world is minutes from the house. These include the Yellowstone River, Lamar River, Slough Creek, Soda Butte Creek, and the Clarks Fork of the Yellowstone. This is a summer rental only! A great family day can be spent touring the famous features of Yellowstone or taking a day trip to Cody, WY to see the Wild Bill Cody Museum, a grnuine rodeo nightly, a gun fight at the original Irma Hotel, good food, and many shops including the Sierra Outlet. Best time for animal watching is June and early July, while the best time for fishing is mid July through September. Hiking is fabulous anytime. The house is clean, spacious and comfortable, with a Great Room and fireplace, modern kitchen and laundry with half bath on first floor. Second floor has two very large bedrooms: One has three single beds and the other a queen bed and a single. This arrangement will sleep a family of six or 5 singles. Also a newly remodeled full bathroom upstairs. Outside thre is a rear deck with gorgeous mountain vies so close you feel like you can reach out and touch them. There is a grill and patio furniture for outdoor dining. There is also a very small stream in the yard which holds a few native Yellowstone Cutthroat Trout. Very private yard. My husband Hank and I have over the years, run a fly fishing school, guided for 10 years in YNP, Hank builds bamboo fly rods. In our non-summer home in VA we fox hunt on horseback and are active conservationists. We are life members of Trout Unlimited, and we both have received numerous awards from that organization. Presently, I am a retired teacher who writes Outdoor columns for a magazine and a local newspaper, and I have had an article on Yellowstone Cutthroat trout printed in Fly Fisherman Magazine. We are 20 minutes from the Lamar Valley which showcase wolves, grizzly, elk, deer, and many others depending on your interests and time of year and time of day to view them. This area is considered the best animal viewing in the Park. Also called the Serengeti of N. America. Hiking in our area can be a wonderful family hike to Trout Lake which is less than a mile long and takes you to a large lake with a walking trail around it, and besides getting to see huge trout there are also fish eating animals in the area as well. 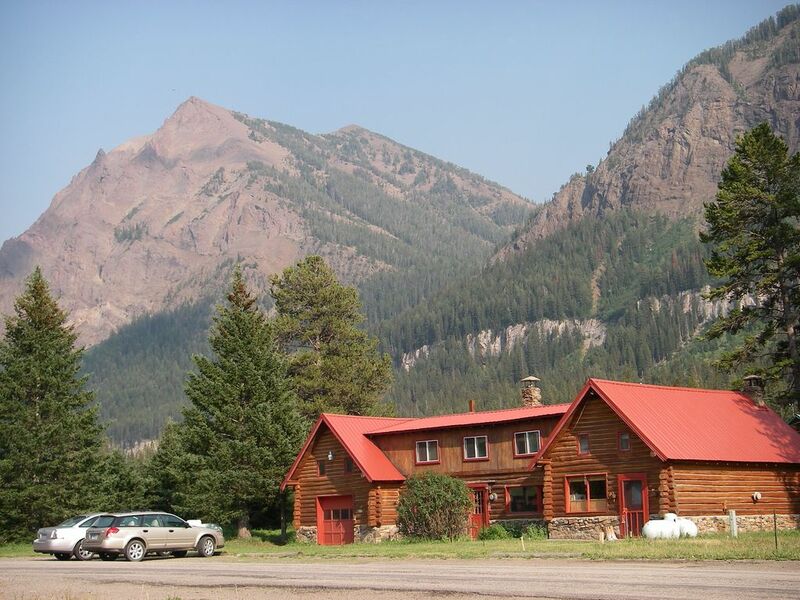 We are one of the closest residences to YNP in any of the gateway communities. In two minutes you can be at the NE gate. The Lamar Valley is 25 minutes and has the best wildlife viewing in the Park for wolves, bears, and bison. toilet, Vanity sink & laundry room with new full size washer & dry. Silver Gate is the Gateway community to the NE gate of Yellowstone Nat'l Park. There is one other village in our area called Cooke City, MT which is an old gold mining town turned touristy. Mountain views both front and rear of our house. Hike to lovely waterfall nearby.Yellowstone Park 1/2 mile. Wood insert in fireplace heats house but hot air wall gas heater is used for quick morning warm-up. House is a year round home and stays warm when heated. No leaky windows or door drafts. All cooking supplies, gas grill, even the wine glasses. Beds made and ready when you arrive. Space for several cars or even a motor home. Available at the house so bring your computer. Access code is posted on the side of the DSL near the telephone. Glass front for fireplace ambiance. We have two coffee makers in case someone needs decafe and others drink regular. Most spices and condiments are here. Several sets of dishes allowing dishwasher to use full loads. Dining area in 1st fl Great Room. Lg. table will sit 8 comfortably. Books on hiking in the area, Rocky Mountain birds, wildlife, animal tracking, wild flowers of the area, and many maps. Fenced back yard with small stream . Large deck just remodeled in private, fenced back yard with lots of privacy. Area has wonderful hiking, horseback riding, museum, old gold mining area with historic sites, excellent fishing, and close to Cody, WY for a day trip to the Wild Bill Cody museum and nightly rodeo. Fabulous location, good fishing, very friendly host and hostess. We are repeat renters. Always have a great time. Our week in Silvergate was one to never forget. We really enjoyed staying in this comfortable cottage. The hospitable owners Marcia and Hank made sure we had nothing to complain about. Being located near a playground and very close to the Lamar valley we enjoyed the outdoors a lot. We especially enjoyed the hummingbirds in the yard, the wildlife in the Lamar Valley and the stunning views from the Beartooth highway. It would sure be great to visit this scenic place again. Thanks a lot Hank and Marcia for helping create great memories! We enjoyed having your lovely family as guests. Your three children brought smiles and fun to the house, and it was great to see them in the playground and off to Soda Butte in their swim suits. Brave! Great location for fishing, hiking, wildlife and Cooke City. Marcia was very helpful with fishing and Yellowstone advice. We'll be back! Thank you for this 5 star review. We do hope to have you come back again. The stay in Silver Gate was wonderful. Marcia and Hank were great hosts. The Cabin was clean and had all the amenities anyone would need. The first day we rode over the Bear Tooth Pass to Red Lodge and on to Cody which was a beautiful scenic drive. The second day, being only a mile from Yellowstone, we toured the whole park. Yellowstone is beautiful and should be a must see for everyone. Thanks Marcia and Hank and thanks to all the other people we meet in Silver Gate all of whom were so friendly and helpful. The cabin is fully stocked, clean and comfortable. Location is just outside Yellowstone NE entrance. There is a General Store and gas stations just up the road in Cooke City. The store is stocked with common items but it is best to buy your groceries beforehand. Marcia and Hank are great hosts. They are next door if you need anything but they respect your privacy. We also took a trip to to Cody, WY beautiful scenery along the way. We had a very enjoyable experience. This is my group's second stay at the Woolman's cabin in Silvergate. To my mind there isn't a better spot for a fly fisherman or lover of nature. The wonderful Log Cabin restaurant is 1 minute away. Not only is great fishing in the park just a few minutes away, but there is free long distance and wifi in the house. It is hard not to be a happy camper with the soda Butte, Lamar and Slough creek just a cup of coffee away! The cabin is clean and ready at arrival. We have found the Owners to be responsive when things arise needing attention. Their long history in the area makes needed services accessible to them. I can certainly understand why the reviews are so positive! If you want a cozy cabin in the middle of paradise check this place out! Day trip to Cody, WY for Wild Bill Cody Museum, nightly full fledged rodeo. There is a cleaning fee for each stay in the amount of $105 which is my contracted cost. I am only to happy to share any and all information and answer questions once I have your contact information.